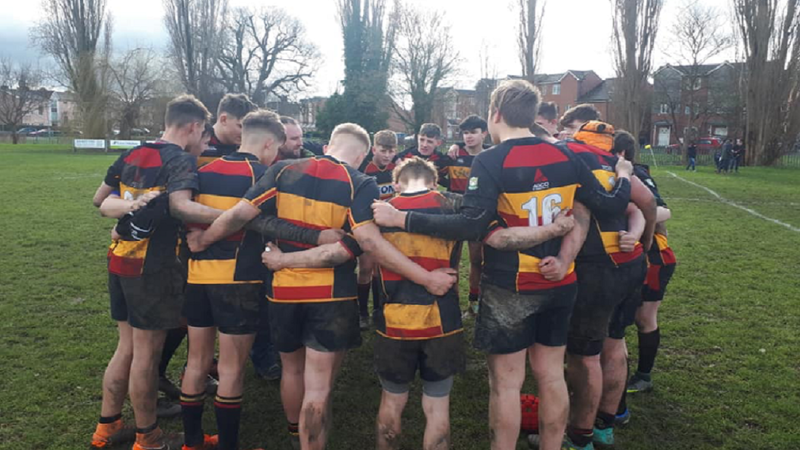 A waterlogged pitch that was unplayable welcomed Cinderford to Tewkesbury RFC, fortunately the main pitch was available and given the wet weather recently was in very good condition. After Cinderfords recent games with Tewkesbury a match without any sort of controversy was to prove short-lived. A ‘pep’ talk by the referee on the vagaries of how to ruck, along with a brief demonstration didn’t bode well. However, after a thorough check on the players studs the game was allowed to begin. Tewkesbury kicked off and it was straight into the hands of Cinderfords marauding forwards. Steff made a penetrating run down route one and was bought down just short of the Tewkesbury 22m line, good work at the breakdown resulted in the ball being coughed up into the hands of Louie who off loaded well to Jack who ran a great line, and after some good work between him and Ed Knox the ball found it’s way into the hands of Wilf, who in typical fashion steamrollered his way across the line, 10 mins in and Cinderford were on the scoreboard. Straight from the restart it was the same again, good ball retention and recycling from the breakdown resulted in a try for team Captain Cobi Gaston under the posts, Toby added the extras to give the boys a 12-0 lead after 10 mins. Tewkesbury to their credit did not lie down, and they looked dangerous on the break, especially when the ball found it’s way into the hands of their fullback. Some great defensive tackling by Cinderford, especially by Hayden ‘Disco’ Robins kept the sheet clean until 17 mins in when Tewkesbury managed to fashion a try after what can only be called some ‘interesting’ decisions by the man with the whistle, but at the end of the day he is the man who calls the shots right or wrong. Cinderford handled themselves well and kept their discipline throughout the rest of a keenly fought first half. HT score Cind 12 Tewks 5. If any game can be described as one of two halves, this was it. It is testament to the team that the coaches are building on how they used their frustration from some of the first half decisions to channel it into their play. From the restart it was clear that any thoughts by Tewkesbury of a Come back were not going to materialise. 5 mins in and Cinderford took possession of the ball on the Tewkesbury 10m line, again the Cinderford forwards controlled play at the breakdown and Wilf was off on one of his breaks, not only is he strong but he is quick and carries the ball well, this time he was bought down short but was able to pop the ball up to his 2nd row team mate Tom Phipps who was on his shoulder to open the scoring under the posts, Toby added the two points. 1 min from the restart and Cinderford were on the front foot again, this time our guest player Keyan, who stood in at short notice, showed his talent with a quick, strong break through the centre to add another 5. To say Cinderford were dominant would be a fair description. In all aspects of their play from defense, through the backs and their big pack they kept Tewkesbury pinned in their own half. 10 mins in and Will A touched down after some brilliant ball handling skills by Steff. Again, Toby slotted the kick over. Two further tries were added in the 12th min by Keyan (another penetrating strong run) and a sprint in from the half way line by Toby after 13 mins that Johnny May would have been proud of, this time Keyan added the extra 2. Tewkesbury had a mini resurgence and with the score sat at 43-5 could easily have given up all hope, but they showed spirit and ran in a well worked try after 19 mins. Cinderford however were not finished, and 22 mins in Keyan completed his hatrick of trys with another show of his skills to touch down under the posts, Cobi Gaston added the conversion this time, much to the delight of his team mates!…Tewkesbury finished off the scoring with a consolation try and conversion to make the final score Tewkesbury 17 Cinderford 50. Well played boys, another gritty performance from the whole team.